Intussusception is the condition when part of the intestine slides (telescopes) into an adjacent part of the intestine. When the intestine telescopes into itself, this portion of the intestine (intussusception) gets kinked. This then leads to the cut off of the blood supply to that part of the intestine and blocks the passage of food and fluid. When the terminal part of small intestine (ileum) slides into colon (large intestine), it is called ileo-colic intussusception. What are the symptoms of ileo-colic intussusception? Intermittent episodes of sudden onset of severe abdominal pain (manifested by excessive crying) that last for a few minutes. The infant may pull up his legs during episodes of pain. In between the episodes of pain, the child may seem to be alright. Abdominal lump felt in right side of upper abdomen (4) lethargy due to dehydration. Bloody stools with mucus (current jelly stools). Abdominal distension and bilious (green) vomiting due to intestinal obstruction. Fever, fast heart rate and low blood pressure can be signs of intestinal perforation. How common is the ileo-colic intussusception? Intussusception occurs more frequently in males. Although intussusception can occur in all pediatric ages, 75% of cases occur in the first two years of life and 90% in children by three years old. There is a seasonal variation that correlates with viral infections. Blood investigations, sonography and x-ray of abdomen are the required investigations. When there is diagnostic dilemma, a contrast study or CT scan of abdomen may be required. What is the treatment of ileo-colic intussusception? The child needs to be stabilized with intravenous fluids. Depending on the clinical condition of the child, x-ray and sonography findings the treating doctor will decide the mode of the treatment (reduction of intussusception). Non-surgical reduction of ileo-colic intussusception; the child is taken to radiology suite and the intussusception is reduced with air enema (pneumatic) under fluoroscopic guidance. After successful reduction the child is observed in the hospital for any recurrence of intussusception which may occur in 5% of patients. Surgical reduction; Surgery is indicated with children with suspected ischemic or compromised intestine, intestinal perforation, suspicion of pathological lead point and failed attempt at non-surgical reduction. After surgery the child will not be fed till the intestine resumes its function and intravenous fluids and antibiotics will be administered to the child. In the majority of patients, reduction of the intussusception is successful with air enema (non-surgical reduction) and surgery is avoided. There is a small risk of intestinal perforation during the procedure which requires a surgery. When the intestine is compromised or there is a pathological lead point, resection and anastomosis of the intestine becomes necessary. This is a major operation and bleeding, infection and leak from suture line are the uncommon possible complications. Recurrence is seen in approximately 5% of patients with both non-surgical and surgical treatment which is usually seen in first six months of initial episode. 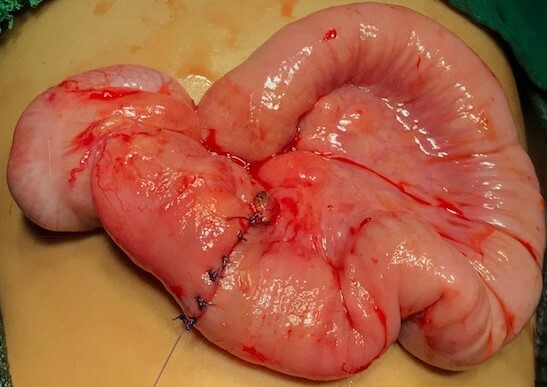 Adhesive intestinal obstruction can occur after surgical treatment of intussusception.